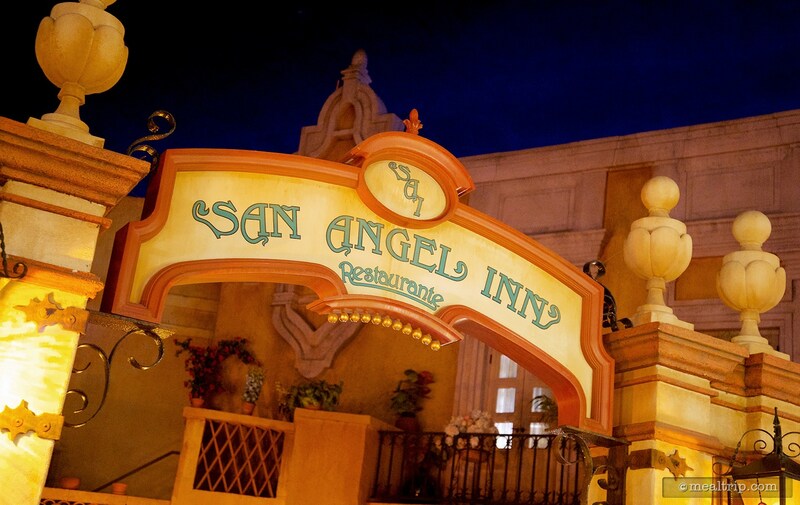 The San Angel Inn Restaurante is based on a 17th-century hacienda at twilight, and it really is one of the more immersive dining settings at Epcot. 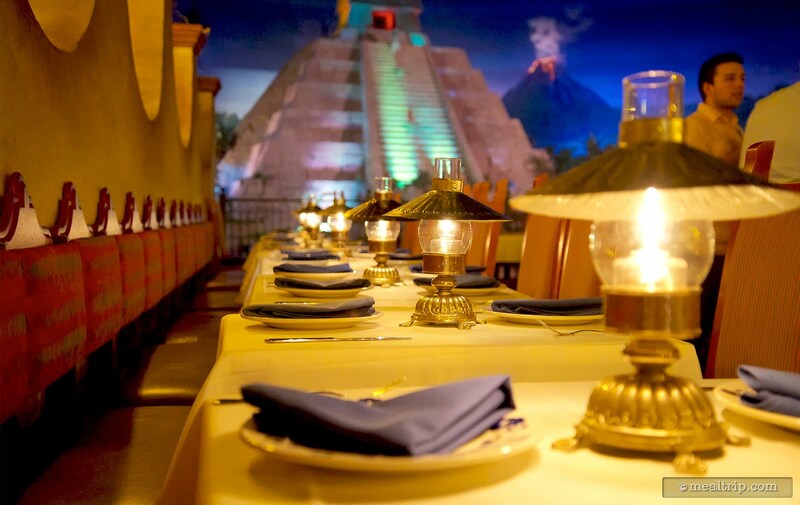 With decor that includes a Mayan temple, an erupting volcano, and a flowing river with boats drifting by, it's definitely a place to check out, at least once. The dinner menu offers dishes that are similar to the lunch menu, but perhaps with few more sophisticated twists here and there. Not only are there some great authentic Mexican entrees such as the Catch of the Day Veracruzana and the Pork en Pipan, but there's a few Mexican-American options as well, like the New York strip with peppers, guacamole and a cheese enchilada. 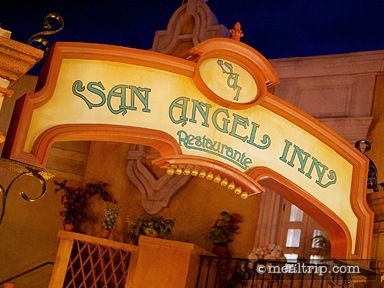 I recently stopped by the San Angel Inn, which is located in Epcot's Mexico pavilion, a beautiful restaurant that arguably has one of the more immersive dining environments in the park. There's just something very cool about the indoor/outdoor plaza style seating area that fully removes you from the hubbub of a theme park just outside the building. 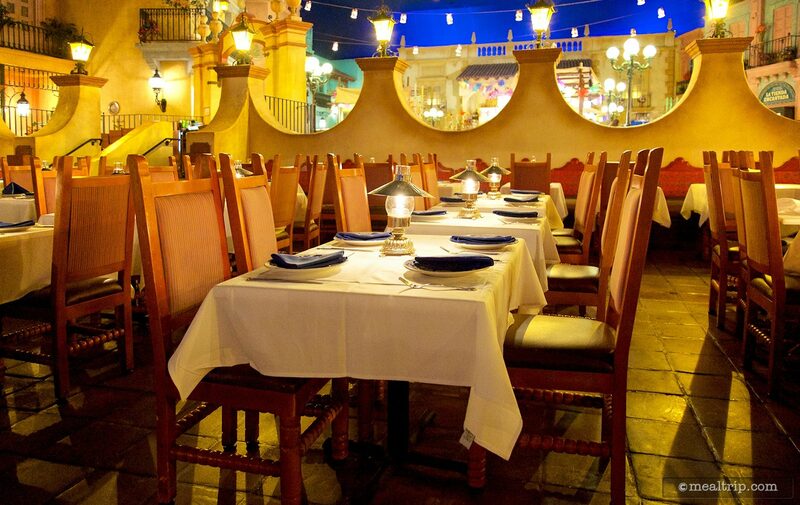 No matter when you go, lunch or dinner, it's always twilight at San Angel… and that can take some getting used to. I'd definitely recommend getting to the pavilion much earlier than your reservation time, taking a stroll through the shops on the main floor, maybe even a trip on the Gran Fiesta Tour boat ride located at the back of the pavilion. After a half hour, your eyes become so much more acclimated to the darkened atmosphere that the twilight theme becomes enjoyable, and not such a strain on the eyes. Each meal at San Angel starts with some chips and two kinds of salsa, both are fairly mild, somewhat thin, and very enjoyable... as long as you're not expecting any heat from serranos or similar peppers. These are complimentary, and they have to be something that everyone will enjoy... middle of the road, and all of that. The main reason that I stopped in was because I had noticed the menu had changed a bit since my last visit. 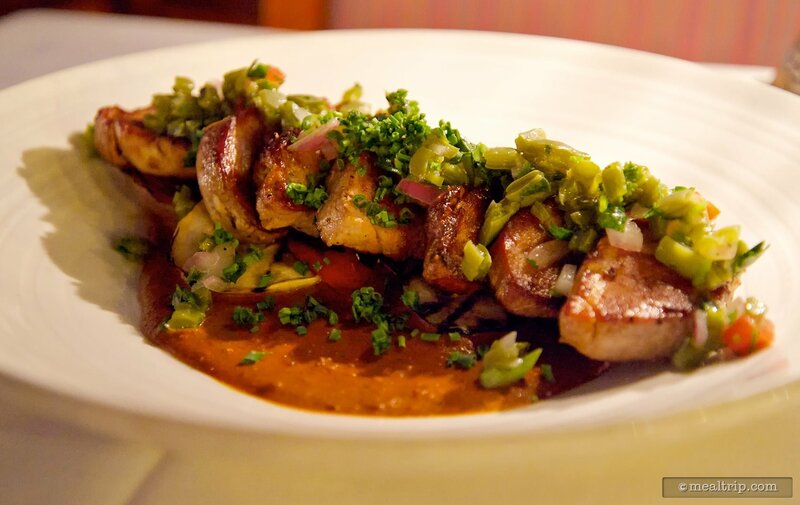 One of my favorite entrees here is the "fish of the season" Veracruzana. At the moment, it's a Red Snapper Veracruzana and I couldn't be happier for everyone that gets to try this fabulous dish with the snapper. Until recently, it seemed the dish was stuck on Mahi or just your generic "white fish", and it's still good… but the Red Snapper really seems to suit this dish the best. The Veracruzana however, was not why I was here. I noticed that a new Tequila flamed shrimp entree had replaced a somewhat less descriptive Shrimp Diabla on the menu. It's something I always wanted to try here, and now that a more complete description of what's going on with the dish is available, I thought I'd give it a shot… and I'm so glad I did. What you basically have here are some decent sized shrimp that have been sautéed in tequila, probably with a bit of cascabel pepper sauce. 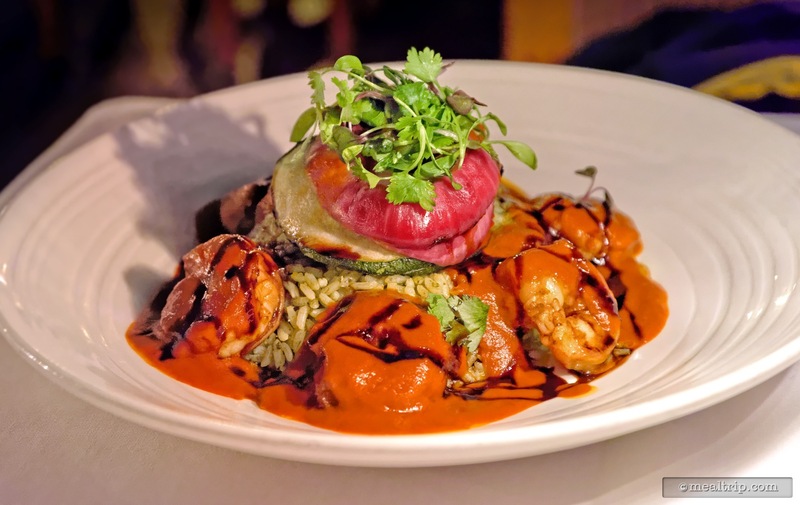 When plated around a giant pile of Poblano rice, a hearty helping of the cascabel pepper sauce is poured over the top of all the shrimp. As if that wasn't enough, a tamarind glaze is then drizzled over the top of that. There's also a stack of grilled mixed veggies in the middle of the rice, forming your own little Aztec pyramid of food. 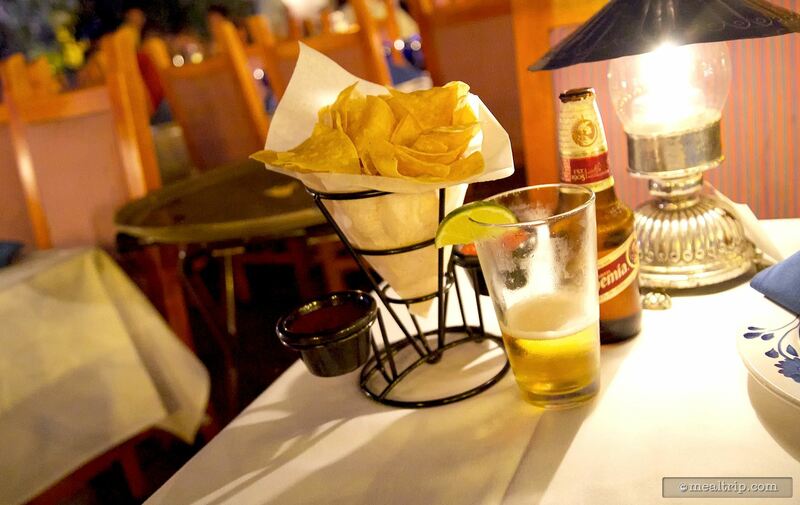 Here again, you might link the term "la Diabla" with something that is going to have a very hot spice note. With a truly home-style version of this dish, it probably would be. Being in the middle of a theme park though, I'd have to say it translates more into a bold, hearty sauce that's full of a somewhat smokey, rich flavor. The tamarind glaze provides a nice touch of sweetness to the mix, as the sometimes acidic notes of the tamarind glaze are completely hidden by the cascabel sauce. I also choose to believe that flaming the shrimp with tequila also adds just a hint of it's own unique sweetness to the mix, as the shrimp begin to caramelize while begin cooked. If you're familiar with the popular whisky sweet and savory bbq sandwiches that are showing up everywhere these days, the Camarones en Tequila is a little like that, but more complex and with shrimp obviously. There's a bold, hearty sauce, with a touch of sweet from the tamarind glaze, and the satisfying snap of a well flamed shrimp acting as the main protein. I really couldn't find anything to fault with this entree. It was a great, medium heat take on Camarones en Tequila. 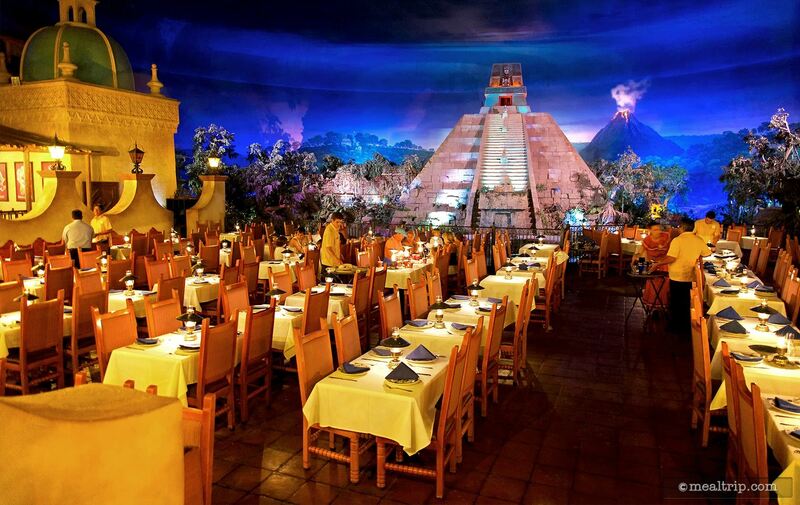 I'm also happy to report, that San Angel Inn still has an amazing service team and management system in place. For as many times as I've eaten here over the years, a well-dressed manager has visited the table to see how everything was going. It's something that should happen at every single Disney restaurant, but sadly, doesn't. Five minutes of extra attention, goes a long way in making you feel like the location really does appreciate your patronage, and is very interested in learning about what you like and don't like about their establishment. 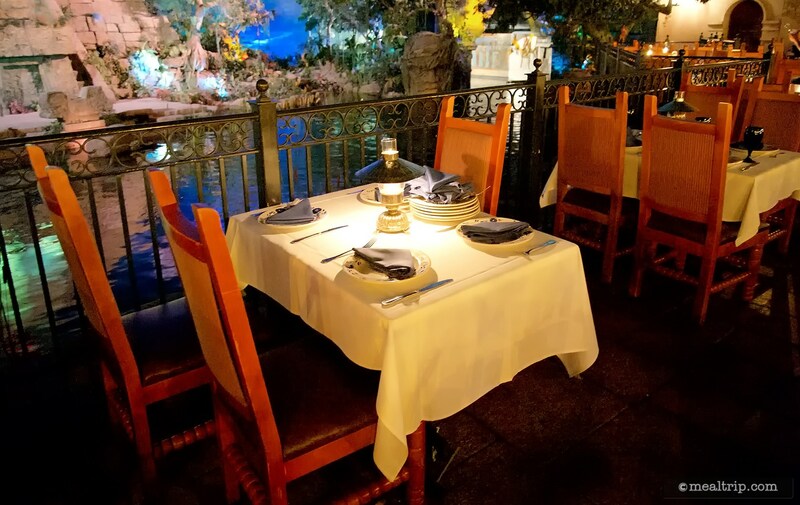 It's one of the things that trickles down though everyone that works there, and what keeps both San Angel Inn and La Hacienda de San Angel high on my list of restaurants you should visit while you're at Epcot.